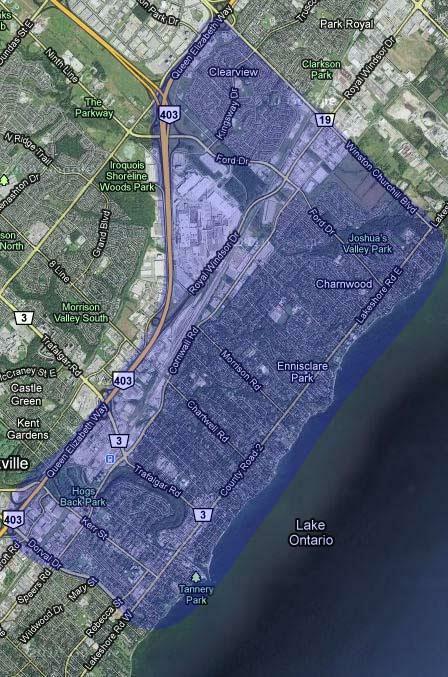 Southeast Oakville is defined as south of the Q.E.W, west of Winston Churchill, and east of Dorval Drive. It includes the neighbourhoods of Clearview (Sherwood Heights), East Oakville, Central Oakville, Morrison, and Downtown Oakville. There are many options for schooling in the area including the new elementary public school in Clearview, James W. Hill. Others include St. Luke's Catholic school, St. Vincent's Catholic school, Maple Grove Public school, Oakville Trafalgar High School (O.T.H.S. ), and St. Mildred's Private school for girls. Students looking for a catholic high school will be bussed to St. Thomas Aquinas Secondary School. This is a traditionally high priced area of Oakville, as it's close proximity to the lake combined with constant upgrading of older homes have resulted in home prices in southeast Oakville being well above the Oakville average. There are still reasonably priced units in this area available if sought after. Clearview is the area east of Ford Drive, south of the Q.E.W., west of Winston Churchill and north of Royal Windsor.The community consists of approx 2200 low and medium density homes. There are many parks and open greenspace areas such as Clearview Park, Wynten Way Park and Kingsford Gardens which are connected by the Avonhead Ridge Trail. Clearview Woods is located across the street from Kingsway Park. The Catholic elementary school, St Lukes, is located in the heart of Clearview. There is also a new public school, James W. Hill. The new school is located next to Clearview Woods also in the heart of the community. Old Oakville stretches east of Sixteen Mile Creek, north of Lake Ontario, south of Cornwall Road and west of Chartwell Road. The Old Oakville area boasts exceptional dining, theaters and shopping. The waterfront features parks, restaurants and marinas.The Oakville Trafalgar Memorial Hospital is located in Old Oakville. Access to the QEW and Oakville GO train station is available from Trafalgar Road. Morrison is bordered by Chartwell Road to the west and Maple Grove Drive to the east, south of Cornwall Road and north of Lake Ontario.The Morrison area contains numerous parks and schools including Oakville Trafalgar High School. There is easy access to the QEW and 403 as well as the GO train stations.